Boy, I’m getting bored of your ways. 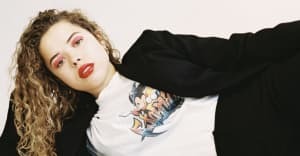 Smoky-voiced 21-year-old Londoner Nilüfer Yanya makes pop that's warm and wise. With Jeff Buckley and Nina Simone running through the veins of her songwriting, she uses her low, deadpan vocal and minimalist guitar to tell a deeply relatable story on her second single, "Keep On Calling." As she explained (pretty frankly) over email to The FADER, the song is about "that moment when you are looking at someone, and you realize how little you like them. But they're so self-absorbed, they wouldn't notice. So you just keep watching them as they keep talking, and you want to say something, but really there is nothing you can say. All you can think is, How did I ever like this person to begin with?...Did I even like them to begin with?" For the visual (directed by her sister, Molly Daniel), Yanya explains, "We didn't want it to focus too much on the 'boy,' because it's more about how the main character feels about them, rather than it being about them. The empty club is a representation of how it feels after a relationship has ended and all the good feelings have gone — all the people have left to go home, and you realize that whole time you have just been in a dark room with some lights."